The Simon Technology Center’s specialists can create customized in-service training to meet the unique needs of professional groups, school districts, universities, parent groups, and more. Whether your organization needs focused, hands-on training on a particular piece of technology or just a refresher on the basics, we can develop a customized program to meet your needs. From learning about the world of apps to hands-on customization of sophisticated software, STC is the right source for high-quality instruction. We’ll help you select the right training from a variety of options to help your group build its assistive technology capacity and increase its tech aptitude. Can’t get your team to PACER Center for training? We’ll bring the technology to you with our traveling tech lab. Simon Technology Center’s specialists can create a customized learning experience that includes all of the latest technologies no matter where you are located. This approach is well-suited for a university setting, and for organizations in greater Minnesota. 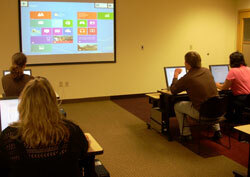 For stress-free technology training, PACER Center’s state-of-the-art facility is an excellent option. PACER can accommodate up to 300 participants in our conference center, or 27 people in the computer lab. Training will include a tour of the Simon Technology Center where your group can discover what is possible through the use of innovative assistive technology. PACER’s specialists will work closely with you to develop training based on your specific needs and preferences. In-service trainings are $150 per hour plus travel expenses, including mileage, travel time, meals, and lodging if applicable. Each participant receives a certificate of attendance, a resource packet with the latest information on the training topic, as well as on-going support from STC's knowledgeable staff. Call the Simon Technology Center at (952) 838-9000 or e-mail [email protected] for more information and to schedule your training.